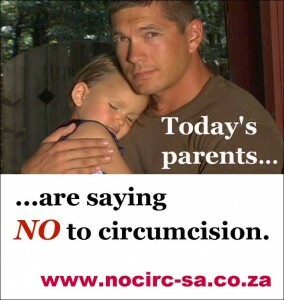 NOCIRC-SA is dedicated to the prevention of routine infant circumcision (RIC) and other forced genital cutting of children, where diagnosable pathology exists requiring such invasive approaches. To contribute towards the legitimate protection of all our children from the violation of non-consenting genital mutilation or modification. To educate fellow South Africans about the real dangers behind circumcision and thereby unite South Africans in the sensible fight against genital mutilation. To serve as a valuable resource base for the ordinary person and medical professional alike. Circumcision of children is now illegal in South Africa, unless there is a clear diagnosable medical pathology – thanks to amendments to the South African Children’s Rights Act. Medical indications for circumcision in infants and children are exceedingly rare, and doctors can no longer act perform this previously elective surgery for frivolous reasons or parental request. (3) Genital mutilation or the circumcision of female children is prohibited. (10) Taking into consideration the child[‘s age, maturity and stage of development, every male child has the right to refuse circumcision. The Human Rights, Law & Ethics Committee of SAMA (South African Medical Association) has issued a statement regarading the proposed CIRCUMCISION OF BABIES FOR SUPPOSED HIV PREVENTION. Men who have already being circumcised are encouraged to visit our partner organisation NORM-SA who can assist you in the process of restoring your birthright, through non-surgical foreskin restoration. However, if you have been fortunate enough not to have been ‘cut’, you will know the value of retaining bodily integrity. Prevention is better than cure and if we can prevent this unnatural practice from taking place at all, then NORM-SA will not be required for the next generation of males!